4) By being ever loving always with a platter of the yummiest delicacies & he's no social snob who gives importance to who wears what or who looks smart or who's high class folks - he teaches us to rise above such factors - Lord Ganesha shares his place with the humble rat. Happy Ganesh Chaturthi. 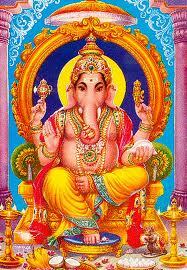 I love Ganesh. He is my favorite God. @Pramoda - It's good enough that you care abt the beliefs of others...thanks a ton. @Rachna - Thanks a ton. He's so loved isn't he - our dear Ganeshji? Hi! May lord Ganesha brings you lots of happiness for you. I like to collect picture of Ganesha in different shapes. He is one of his kind and very intellectual one. Do you know, why he is worshipped first of all Gods?? Once you know the answer, you will be convinced. Thanks Santosh, yes i do know...Luv Ganesha too!